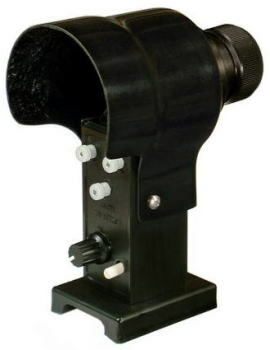 2.3x40mm erect-image extra-widefield finderscope. The optics of WideBino28 and an LED reflex sight finder are combined to yield red reticles in the center of 28-degree FOV erecting field. The reticles are 0.5-degree and 2-degree concentric circles. Brightness adjustable with a pulsed or continuous illumination of the reticles. Collimation function with 3 thumbscrews equipped. Large dewcap to cover the reflex screen and the objective lens is made of GFRP (Glass-Fiber Reinforced Plastic), eliminating dew and stray lights to keep good image contrast. A specially shaped GFRP dustcover is standard. Easy clip-on / clip-off mounting to baseplate - no screws necessary. Comes with 2 baseplates letting you use it on two telescopes. The baseplate can be fixed with double-sided adhesive tape (included) or a screw. WideFinder28 has a lot of advantages such as "4 or 5 times larger field of view than a normal optical finderscope", "1 or 2 magnitude darker stars can be detected than a normal reflex sight finder", "right-side-up erecting image" and "illuminated reticles". Those features embody an ideal form of a finderscope for astronomical use. Compact and lightweight to fit various telescopes and binoculars. Especially recommended to Dobsonian users. *Refer to WideBino28 as for the detailed optical features.